Using the Easy Flipping toolbar, you can rapidly flip through drawings in the Drawing view, just as you would with paper drawings in traditional animation. NOTETo learn more about this toolbar, see Easy Flipping Toolbar. By default, the Flipping toolbar will flip through all drawings in the range specified in its Preroll field. 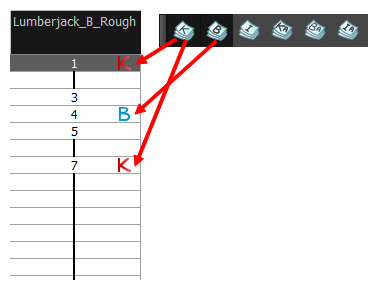 Optionally, you can use the Flip toolbar to only flip through certain types of drawings, such as key drawings or breakdowns, provided that you marked these drawings as such prior—see About Marked Drawings. NOTETo learn more about this toolbar, see Flip Toolbar. In the top menu, select Windows > Toolbars > Flip. The Easy Flipping toolbar will only flip through drawings marked with the enabled drawing types. NOTEIf no drawing types are selected in the Flip toolbar, the Easy Flipping toolbar will flip through all drawing types.